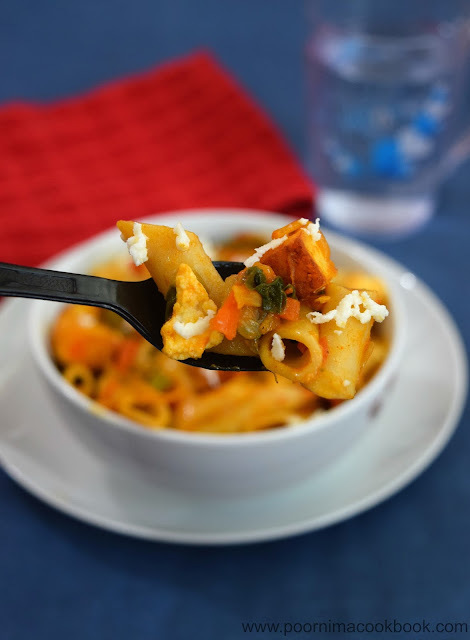 This Indian style pasta recipe is loaded with Paneer (Indian cottage cheese) and mixed veggies which makes the dish colourful, healthy and tasty. I have added Indian spices & masala to this dish to give a nice flavour and twist to the recipe. After I prepared and shared it with my family and friends; everybody enjoyed it. 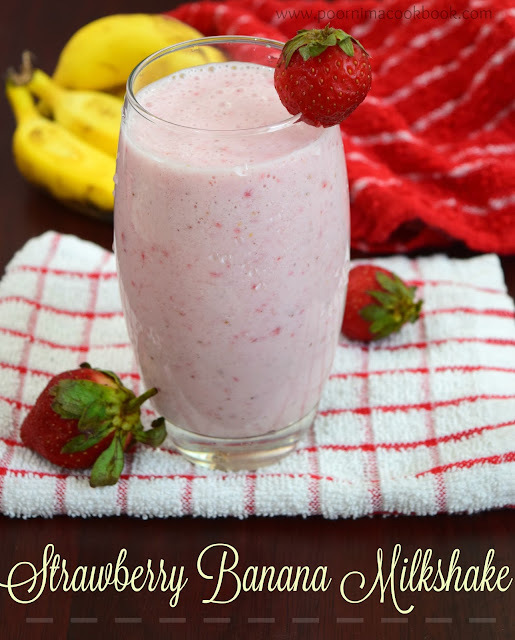 This dish is perfect to pack for your kids lunch box and picnics. 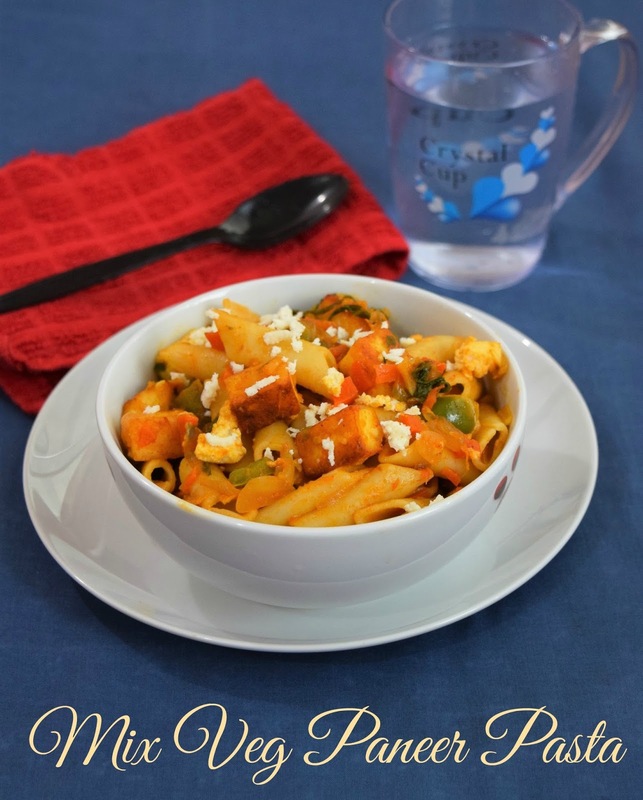 Try this mouthwatering Mix veg paneer pasta and relish! Add water, salt and oil in a shallow pan and allow to boil. Once it starts boiling, add the pasta to it and cook till it becomes soft. Once it is done; drain and keep aside. 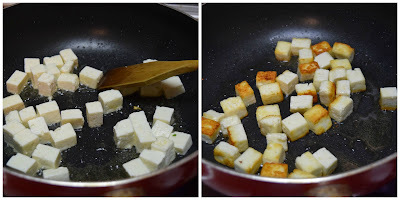 Add oil and shallow fry paneer till it becomes golden brown and keep Keep aside. You can reserve some paneer(grated / scrambled) and garnish it while serving. Heat oil / butter in the same pan, add onions and finely chopped ginger & garlic. Saute till it becomes translucent. Next add chopped carrot, spinach, capsicum and spice powders. Saute well in medium flame and add 1 cup water; close the pan with the lid and allow to boil till the veggies are cooked. Once it is done, reduce the flame and add fried paneer, cooked pasta, tomato sauce and coriander leaves. Mix well till it is combined and switch off the gas. 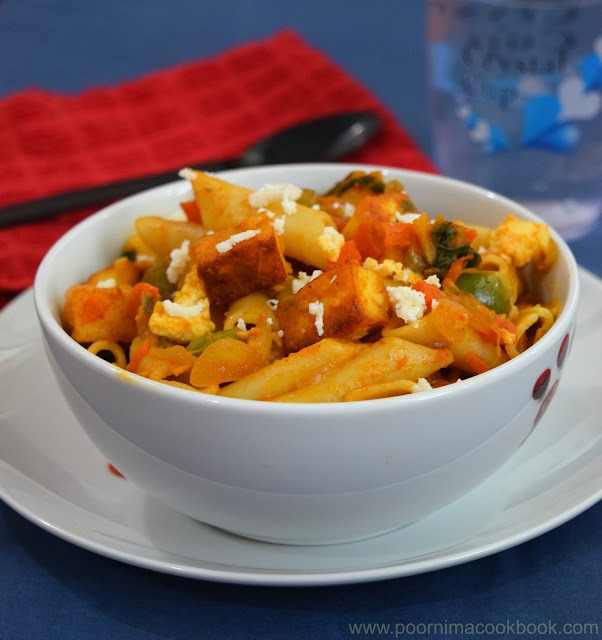 Garnish with scrambled paneer & serve hot. ENJOY! You can use any pasta variety for this dish. You can add cream to the gravy, before adding pasta to give rich taste to the dish. Instead of paneer, you can use soya / tofu. Frying the paneer is optional. You can also use it raw or scrambled for the whole dish. 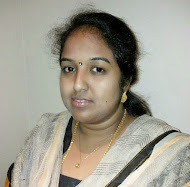 You may choose the variety and quantity of vegetables to be added for the dish.